Tomorrow night we’re hosting a very special guest for the October Artwalk: Brian Sterkovsky. Not only does Brian play and build harps, he also plays electric banjo and writes and sings his own words and poetry. Not only does he do all this, he’s one of our favorite regular customers at Miro Tea! Tomorrow night at 7pm Brian will be performing on harp as well as doing some spoken word performance for the Artwalk opening of Maryam Tohidi. 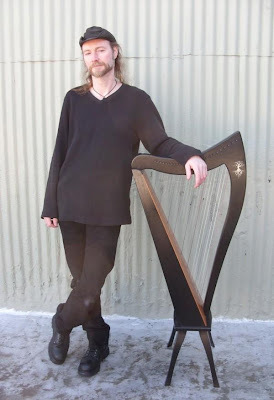 For a taste of Brian’s work, you can visit his MySpace (http://www.myspace.com/briansterkovsky)–you’ll get a sampling of his eerie harp originals, as well as his spoken word and gitjo songs. He’s also got two albums worth of material (one of harp and one of gitjo/singing) available for purchase digitally or on CD. Brian is extremely talented and a great friend of Miro Tea, so come on down tomorrow night, grab a roasted apple fig and walnut crepe (with ice cream) and a cup of Irish Breakfast tea, and show your support!